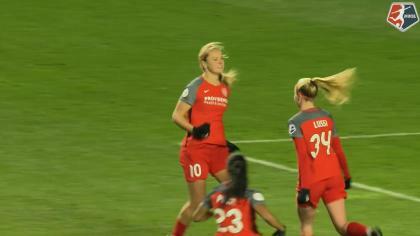 The Chicago Red Stars took a 2-0 lead, but Portland Thorns FC stormed back with two goals of their own and the teams split the points with a 2-2 draw in front of 18,631 fans at Providence Park in Portland, Oregon. The Thorns are now 9-6-6 with 33 points and in third place. The Red Stars are now 7-4-10 with 31 points and in fourth place. The standings could change on Sunday morning when the Pride (8-7-6, 30 points) resume their lightning-suspended match with the Courage. The Red Stars took the lead courtesy of a Sam Kerr brace. Her first goal coming at the end of the first half and then her second at the start of the second half. Kerr now leads the Golden Boot race with 12 goals, jumping ahead of Thorns midfielder Lindsey Horan. 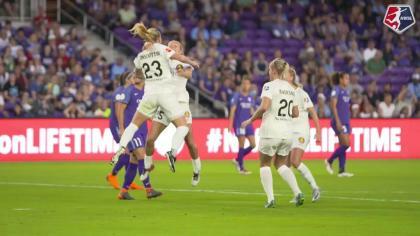 Kerr’s first came in the 44th minute following a strong individual effort in the box to get around Thorns defender Emily Sonnett and then hit her shot past goalkeeper Adrianna Franch. Red Stars forward Yuki Nagasato earned her sixth assist of the year on the goal, all of which have come on Kerr goals. Her second goal came in the 48th minute, a header in the box to finish off a cross from Red Stars midfielder Vanessa DiBernardo to put the Red Stars up 2-0. Kerr’s 12 goals have come in 16 games for the Red Stars. She also has two assists. The Thorns started their comeback in the 60th minute with a goal from Tobin Heath. Thorns forward Christine Sinclair took a pass from Heath near the midfield sideline and put on a spin move to escape pressure from Red Stars midfielder Nikki Stanton, before taking the ball into the final third. The Thorns had one opportunity cleared out of the box by the Red Stars, but the Thorns retained possession — and eventually Ellie Carpenter served the ball back into the area and towards the head of Horan. Red Stars goalkeeper Alyssa Naeher came off her line to punch the ball away from Horan, but only as far as Heath, who headed it into the open net to get Portland their first goal of the game. And then it was Sinclair who scored the game’s final goal in the 69th minute. Sinclair sprung Heath down the right sideline and then Heath served a low cross back into the box as Sinclair and Caitlin Foord ran into the path of the ball. Foord let the pass go behind her and to a wide-open Sinclair, who slid and finished it off with her left foot. It’s Sinclair’s eighth goal of the season to go with six assists. The Red Stars had one late chance to get the win on a shot by DiBernardo, but Franch got both hands on the shot to tip it off the post. The Thorns finished the match with the better of possession, 54.2% to 45.8%. The Red Stars took more shots (18-7) and shots on goal (7-4). The Red Stars will next face their nearest playoff competitor, the Orlando Pride, on the road on Saturday night. The Thorns next face Sky Blue FC at home on Wednesday night and then will head to Washington, D.C., to face the Spirit at Audi Field on Saturday. Correction: An earlier version of this recap said the Red Stars held the possession edge in this match. It was the Thorns. Match ends, Portland Thorns 2, Chicago Red Stars 2. Second Half ends, Portland Thorns 2, Chicago Red Stars 2. Attempt missed. Rosie White (Chicago Red Stars) header from the left side of the box is close, but misses to the left. Assisted by Vanessa Di Bernardo following a set piece situation. Foul by Andressinha (Portland Thorns). Attempt missed. Yuki Nagasato (Chicago Red Stars) right footed shot from outside the box is just a bit too high. Attempt missed. Yuki Nagasato (Chicago Red Stars) left footed shot from the right side of the box misses to the left. Attempt saved. Vanessa Di Bernardo (Chicago Red Stars) left footed shot from outside the box is saved in the top right corner. Assisted by Michele Vasconcelos. Attempt blocked. Rosie White (Chicago Red Stars) right footed shot from outside the box is blocked. Assisted by Michele Vasconcelos. Attempt saved. Casey Short (Chicago Red Stars) header from the centre of the box is saved in the centre of the goal. Assisted by Danielle Colaprico with a cross. Corner, Chicago Red Stars. Conceded by Midge Purce. Attempt saved. Ellie Carpenter (Portland Thorns) right footed shot from outside the box is saved in the centre of the goal. Corner, Portland Thorns. Conceded by Julie Ertz. Rosie White (Chicago Red Stars) is shown the yellow card for a bad foul. Andressinha (Portland Thorns) wins a free kick in the defensive half. Substitution, Chicago Red Stars. Rosie White replaces Nikki Stanton. Substitution, Portland Thorns. Midge Purce replaces Hayley Raso. Attempt missed. Hayley Raso (Portland Thorns) right footed shot from outside the box is too high. Assisted by Christine Sinclair. Offside, Portland Thorns. Lindsey Horan tries a through ball, but Hayley Raso is caught offside. Goal! Portland Thorns 2, Chicago Red Stars 2. Christine Sinclair (Portland Thorns) left footed shot from the centre of the box to the top left corner. Assisted by Tobin Heath. Offside, Portland Thorns. Ellie Carpenter tries a through ball, but Caitlin Foord is caught offside. Lindsey Horan (Portland Thorns) wins a free kick on the left wing. Corner, Portland Thorns. Conceded by Katie Naughton. Goal! Portland Thorns 1, Chicago Red Stars 2. Tobin Heath (Portland Thorns) header from the centre of the box to the top right corner. Substitution, Portland Thorns. Andressinha replaces Celeste Boureille. Corner, Chicago Red Stars. Conceded by Meghan Klingenberg. Attempt blocked. Vanessa Di Bernardo (Chicago Red Stars) left footed shot from the centre of the box is blocked. Hayley Raso (Portland Thorns) wins a free kick in the defensive half. Attempt saved. Yuki Nagasato (Chicago Red Stars) header from the centre of the box is saved in the centre of the goal. Assisted by Vanessa Di Bernardo. Goal! Portland Thorns 0, Chicago Red Stars 2. Samantha Kerr (Chicago Red Stars) header from the centre of the box to the bottom right corner. Assisted by Vanessa Di Bernardo with a cross. Offside, Chicago Red Stars. Samantha Kerr tries a through ball, but Alyssa Mautz is caught offside. Attempt missed. Meghan Klingenberg (Portland Thorns) right footed shot from outside the box misses to the left. Ana Maria Crnogorcevic (Portland Thorns) wins a free kick on the right wing. Substitution, Chicago Red Stars. Danielle Colaprico replaces Morgan Brian. Second Half begins Portland Thorns 0, Chicago Red Stars 1. First Half ends, Portland Thorns 0, Chicago Red Stars 1. Goal! Portland Thorns 0, Chicago Red Stars 1. Samantha Kerr (Chicago Red Stars) right footed shot from the centre of the box to the bottom left corner. Assisted by Yuki Nagasato. Offside, Portland Thorns. 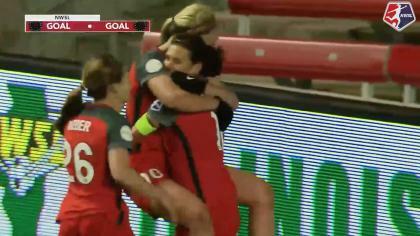 Lindsey Horan tries a through ball, but Tobin Heath is caught offside. Attempt blocked. Christine Sinclair (Portland Thorns) left footed shot from the left side of the box is blocked. Assisted by Hayley Raso. Tobin Heath (Portland Thorns) wins a free kick on the left wing. Foul by Casey Short (Chicago Red Stars). Attempt saved. Samantha Kerr (Chicago Red Stars) right footed shot from outside the box is saved in the bottom left corner. Assisted by Yuki Nagasato. Attempt blocked. Samantha Kerr (Chicago Red Stars) right footed shot from the centre of the box is blocked. Assisted by Arin Gilliland with a cross. Delay in match Lindsey Horan (Portland Thorns) because of an injury. Corner, Chicago Red Stars. Conceded by Emily Menges. Attempt missed. Julie Ertz (Chicago Red Stars) left footed shot from the centre of the box is just a bit too high. Assisted by Arin Gilliland following a set piece situation. Foul by Celeste Boureille (Portland Thorns). Offside, Chicago Red Stars. Arin Gilliland tries a through ball, but Samantha Kerr is caught offside. Attempt missed. Morgan Brian (Chicago Red Stars) right footed shot from the centre of the box misses to the left. Assisted by Arin Gilliland following a set piece situation. Foul by Ana Maria Crnogorcevic (Portland Thorns). Attempt saved. Vanessa Di Bernardo (Chicago Red Stars) right footed shot from outside the box is saved in the centre of the goal. Julie Ertz (Chicago Red Stars) wins a free kick in the defensive half. Attempt saved. Lindsey Horan (Portland Thorns) header from the centre of the box is saved in the top right corner. Assisted by Tobin Heath. Lindsey Horan (Portland Thorns) wins a free kick on the right wing. Attempt missed. Yuki Nagasato (Chicago Red Stars) left footed shot from the centre of the box misses to the right. Assisted by Arin Gilliland. Offside, Chicago Red Stars. Arin Gilliland tries a through ball, but Alyssa Mautz is caught offside. Yuki Nagasato (Chicago Red Stars) wins a free kick in the defensive half. Vanessa Di Bernardo (Chicago Red Stars) wins a free kick in the defensive half. Attempt missed. Samantha Kerr (Chicago Red Stars) right footed shot from outside the box is too high. Assisted by Vanessa Di Bernardo. Morgan Brian (Chicago Red Stars) wins a free kick in the defensive half. Hayley Raso (Portland Thorns) wins a free kick in the attacking half. Attempt missed. Samantha Kerr (Chicago Red Stars) right footed shot from outside the box is too high. Assisted by Yuki Nagasato with a headed pass.